WELCOME TO THE SCI-FI CAFE. 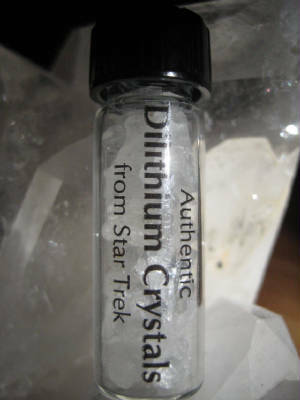 WHILE SUPPLIES LAST, GET THESE AUTHENTIC STAR TREK DILITHIUM CRYSTALS, THAT WERE ACTUALLY USED ON THE ICONIC TELEVISION SERIES, STAR TREK . THESE ( SHOW USED ) DILITHIUM CRYSTALS COME DIRECTLY FROM THE JAMES "SCOTTY" DOOHAN FAMILY. EACH COMES WITH 2 CERTIFICATES OF AUTHENTICITY. ONE FROM THE DOOHAN'S AND A COPY OF THE COA FROM THE IAW, CBS /PARAMOUNT SANCTIONED AUCTION. WANT A LARGE SHOW USED DILITHIUM CRYSTAL? Click the image to link to our Ebay page. 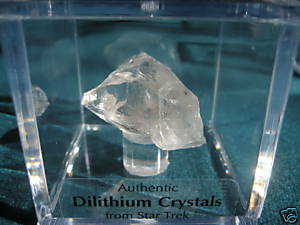 THESE DILITHIUM CRYSTALS ARE ACTUALLY REAL, SHOW USED PROPS FROM THE STAR TREK SERIES. YOU CAN ONLY GET THESE HERE. ONCE THEY’RE GONE, THEY’RE GONE (LIMITED SUPPLY).